Special economic zones and sit-ins. Mega-projects and marches. Public-private partnerships and pitched battles. Precociously, because they are desperate, state governments are willing to hand land, forest, water over to industry. Raucously, because they are really desperate, people all over India have begun to use all available means to contest the usually coercive intrusion of the State into their lives, and livelihoods. Consider, as symptom, the Orissa government's deal with Korean steel-making giant POSCO. The devil here, as ashutosh mishra reports, lies only in the details. It is credible to ask is violence the inevitable effect of corporate investment, indigenous or foriegn? Is deliberate sellout the only route state governments can take to attract companies? What vision is it that has completely blinded the State to its brazen loss of credibility? Who matters, people or voters? These questions are neither rhetorical nor emotional. Merely see the countrywide scenario arnab pratim dutta has compiled. 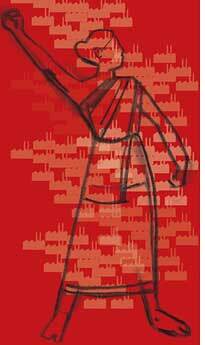 India's new road to growth, interpreted by the State as an imperative to simply industrialise, today leads...where? South Korean steel giant posco's proposed steel plant hangs in virtual limbo. Popular resistance by the posco Pratirodh Sangram Samiti has rendered land acquisition for the Rs 51,000 crore project--hailed as a foreign direct investment coup--quite impossible. While both the company and the state government have announced rehabilitation and resettlement (r&r) measures, on the ground people are getting restive. "They are yet to discuss the matter in detail with us," says Gadkunjanga sarpanch Nakul Sahu. He asserts people will settle for nothing less than permanent jobs for all 3,600 affected families in the three panchayats.As for land, people are demanding Rs 40 lakh per acre for private land and Rs 25 lakh per acre of betel and cashew plantation (grown here on encroached government land in the hinterland of river Jatadhari, where the company proposes a 10 mt per annum capacity captive port in the first phase). Sahu says the annual betel trade here is worth Rs 30 crore; cashew fetches even more. More than 2,000 families are directly engaged; many more benefit indirectly. "Each farmer employs at least three people to take care of the vines. Then there are others who supply bamboo twigs to support the vines or to make a thatched roof over the plantations," explains Jiban Lal Behera, former panchayat samiti member of Noliasahi, who is into betel cultivation. "Betel cultivation is a perennial source of income and there can be no compensation except an equally lucrative and stable alternative source of employment," says Sahu. The sarpanch asserts the demand for permanent employment as well as the land price people want are justified. Prices are yet to be negotiated; will posco pay? At least people like Sahu or Behera are willing to talk to posco. The posco Pratirodh Sangram Samiti (ppss), on the other hand, is dead against. "There is no way posco can set up a project. 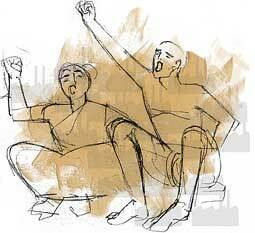 They could not do it for last three years and they will not succeed in future," says ppss leader Abhay Sahu. He blames the company and the government for violence in the area. Indeed, since last year, clashes have taken a sinister twist, pitting local villagers against each other (see timeline Out on a limb). The latest clash occurred on June 20 at Gobindpur village, in which ppss supporter Dula Mandal was killed while five others sustained serious injury. Afterwards, rival groups hurled bombs at each other, and ppss activists shut up 59 project supporters in a school, releasing them only after police assured action against the culprits. Finally 26 project supporters were arrested. The district administration had to deploy 14 platoons of police force at the project site. The arrest has infuriated people who, allegedly backed by the company, were trying to generate support for the plant. Members of the United Action Committee (uac), generally sympathetic to the company's cause, have now decided to harden their stand. "It is the government which is delaying the project. While it has completely failed to maintain law and order, it is trying to victimise innocent people. If this continues, no one will support the project," says Tamil Pradhan, a prominent uac member. The entire area is still on a short fuse. Pohang Steel Company's (POSCO's) project in Ersamma block of district Jagatsinghpur, Orissa, comprises the following elements 1) Steel plant of 12 MT per annum capacity in Jagatsinghpur district; 2) Captive port at Jatadharmuhan creek; 3) Captive iron ore mines at Khandadhar in Sundergarh district; 4) Water supply line from Jobra barrage; 5) Township; 6) Rail linkage. The project requires 1,620.361 ha. Of this approximately 177.252 ha is private land and 1443.11 ha is government land. A lot of the latter has been encroached upon; betel and cashew plantations flourish here. So far, the company has been allotted 207.19 ha of non-forest and non-encroached government land. So why isn't posco packing up? The Memorandum of Understanding (mou) signed on June 22, 2005, is heavily loaded in its favour (see box More sops). The posco plant, near Paradip, will use state-of-the-art finex technology, which eliminates the first step in the steelmaking process (sintering and coking) and allows the direct use of low-cost ore fines and coal, so bringing down the cost of overall plant operation.The company will also set up a lime calcinating plant, an oxygen plant, a captive power plant, and a steel melting shop with converters, casters and rolling mills. But its greatest incentive lies elsewhere. "Forget the steel plant. 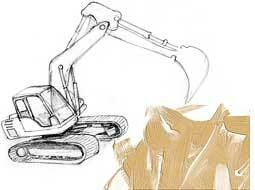 posco is more interested in the captive port and in iron ore," says Mohapatra. In 2006, the state government recommended to the Centre that posco be granted a prospecting licence for the 6,204 ha Khandadhar iron ore mine. It was the state's only recommendation. But there were other contenders and so the Centre advised the government to hear out all parties. Today, sources say, the process of hearing over 200 applicants, including public sector Kudremukh Iron and Steel Company, is on, but the government has almost made up its mind to recommend posco's case again. What will the company gain? For starters, a precedent the first foreign company to obtain a mining lease in India. More to the purpose, it will be able to source iron ore dirt cheap. The company requires 600 million tonnes of average 62 per cent Fe content iron ore to enable steel-making. While the market price of ore today is about Rs 5,000 per tonne, the company will get it for around Rs 600 (this includes royalty of Rs 27 per tonne; digging and transportation costs). In other words, a cool profit of Rs 26,400 crore over the 30 years the mining lease will initially be granted. The mou says renewal for another 20 years may be considered if the company applies. The sweetness doesn't end here. Sources say the state's industrial policy itself was jigged to make things easy for posco before the mou was signed. Now, a company is not obliged to make a physical investment of at least 25 per cent in its projects to be eligible for a prospecting licence or mining lease; they can, instead, place orders for equipment worth the same amount to gain eligibility. Just consider posco's case in this context the mou says recommendation for the mining lease will be made in two phases; the government will take a decision pertaining to the first phase after the company makes an award of 50 per cent of orders for civil and structural contracts, in terms of value, and places 20 per cent of firm orders for machinery, in terms of value. Yes. Says the mou "The Company may swap certain quantities (not exceeding 30 per cent of the total requirement for the Paradeep Plant annually) of such iron ore which have high alumina content with equal quantity of low alumina content iron ore of equivalent or better Fe content imported for blending...Any export of iron ore by way of swap will be allowed only after an equivalent quantity of ore has been imported for the plant (emphasis added). " The finex technology the plant will use renders this arrangement quite obsolete; so why is it there? Moreover, where will the plant import ore from? Sources say Brazil. This issue has raised hackles, as high as state coalition leader Jual Oram (see box "Dear Naveen ji"). In addition, posco has requested an additional 400 mt of iron ore from India for its existing steel plant in South Korea. It seems the company wants a long-term commercial supply arrangement from the open market. But the mou has also taken care of this. No mine-able reserves can be provided by the Orissa government purely for the purpose of direct exports beyond that indicated for value addition in the steel plant; nevertheless, the state government will help posco in establishing suitable contacts and interfaces with the government of India for the purpose. Sources close to the company now say posco may drop this request; critics are far from convinced. "Unless the mou itself is revised and this portion removed from the document, one can never be sure," warns Mohapatra. "There is no denying the hush-hush nature of the negotiations. We have been demanding a white paper on posco from the government but it is yet to come out with one," says former minister Bijay Mohapatra. The Environment Impact Assessment (eia) report has also been challenged. In objections filed before the Orissa State Pollution Control Board, Biswajit Mohanty, secretary of the Wildlife Society of Orissa, said disposal of huge quantities of dredged material in the sea would impact the feeding grounds of the turtles at Devi river mouth and Gahirmatha Marine Sanctuary. Pointing out that the eia does not contain any information on the extent and intensity of illumination to be caused by shipping traffic and the port facilities, Mohanty also said such illumination would impact the mass nesting beach and congregation at Devi river mouth. The eia report, however, does not contain any data on the abundance of such populations and their dynamics; "nor is there mention of the likely impact of shipping traffic, oil spillages and other marine pollution on Olive Ridleys and their nesting activity". Mohanty has urged the Board to reject the eia report and call for a detailed study. The company received in-priciple approval, on October 2006, from the board of approvals of the Union ministry of commerce. posco, at this stage, represented the project as a composite sez, to avail the benefit of a single window clearance system. However, this shortcut did not work. Final approval, as sez, never came from the ministry of commerce. This made posco change its plan. It then applied for separate environmental clearances for its port and the first phase of plant construction. On April 15, 2007 a joint public hearing was held in Kujang, under heavy security, for the port and plant. Villagers boycotted the hearing. In May 2007, posco obtained environmental clearance to begin plant construction, and in the following month for the port. The Union ministry of environment and forests (moef) erred here; it didn't approach the project as a single entity, so overlooking the cumulative impacts of the project's components. The port and plant construction would divert 1,253.2 ha of forest land; 280,000 trees would be felled. For diverting forest, a mandatory forest clearance is required from the Forest Advisory Committee (fac), under moef. 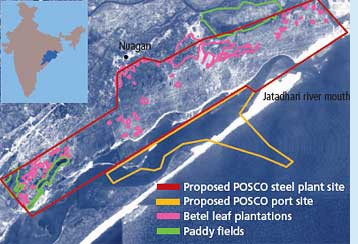 posco applied; fac recommended forest clearance on August 9, 2007. In this entire process, the state government played a major role. It followed the spirit of the mou so closely that it even ignored its own officials as an April 2006 letter from the principal chief conservator of forest puts it, "It is observed the project has several components.... However, there is no mention of requirement of forest land for all these components. Since all these components are integral part of the project, diversion of forest land for one of the components in isolation would not be justified". Similar objections were also raised by the deputy conservator of forests attached to the Industrial Infrastructure Development Corporation of Orissa to posco. Also, in December 2006, in a review meeting chaired by the principal secretary had noted that the plant and the port could not function without the iron ore and coal mines and the ancillary infrastructure. This, too, the government overlooked while recommending environment and forest clearances to moef. But posco still cannot go ahead with the first phase of construction. On April 27, 2007, the Supreme Court of India ordered all clearances by the fac would be reviewed by the court's forest bench handling all forest-related cases since 1995. The Central Empowered Committee (cec), the expert body on environmental cases the apex court had set up, would also have to give its opinion on such clearances, it said. The cec assessed the posco forest clearance and gave its report on November 14, 2007. It noted that instead of piecemeal diversion of forest land for the project, it would be appropriate the total forest land required, including for mining, be assessed. and a decision to divert forest land be taken for the entire forest land, after considering the ecological importance of the area, number of trees required to be felled, adequacy and effectiveness of the r&r plan for the project-affected persons and benefits accruing to the state. "The diversion of forest land for the plant, without deciding the linked uses, particularly the mining project, may not be in order". It further suggested an independent expert committee "assess impact of the cutting of such a large number of trees and suggest mitigative measures for the area, specially since there is a large dependence of local population on these forests". The company has maintained the captive iron ore mining areas be de-linked from the refinery and the port. Meanwhile, a July 11, 2008 write-up in steelguru.com quotes the Economic Times and says the project "may finally get going with the government expected to give nod to its proposal for iron ore mining lease and forest diversion clearance plan almost simultaneously next month." Continues this article "The report cited an official source as saying that 'The government is according utmost priority to the posco project. In this regard its proposal for prospecting licence for Khandhadhar iron ore block in Orissa would be given as soon as the state sends its recommendations to the Centre. The Supreme Court's Central Empowered Committee on environment has also said that it would recommend for land diversion clearance once there is clarity on mining lease for the project.'" "The state is conducting a public hearing from other applicants for the Kandhadhar block and expects to conclude the process by July 26," steelguru.com reports, "before finalizing the name of posco as the most deserving applicant with a firm investment commitment and project development plan. Though the mining block has a reserve of about 200 million tonnes of iron ore, sufficient to meet just one third of posco's total requirement, it could support the entire first phase of the project." Meaning that all the hurdles in posco's way are being rapidly cleared by the authorities concerned. Is India building its developmental house from the roof down, with a non-existent foundation? Arun Kumar, professor of economics at the Jawaharlal Nehru University in Delhi, thinks so. "The government, through its policies, is trying to replace the pre-existing agriculture in the rural areas with manufacturing and servicing industries. This is creating a huge gap in the number of people displaced by these projects in contrast to the number of people who are given employment," he says. People affected by development projects are often not taken into confidence before such projects are formalized, says Rajya Sabha mp and chief of Revolutionary Socialist Party Abani Roy. "There is a complete and utter secrecy of these projects," he says. Further, "there is also the question about the benefits, which do not percolate down to the people who are being shunted out of their land. This is why Nandigram and Singur happened." Manshi Asher, a Pune-based independent researcher currently working on the effect of special economic zones (sezs) on livelihoods and environment in India, agrees. "Affected people are kept in the dark regarding information about the project. The executive summaries of environment impact assessments and the detailed project report are never shared with the affected people even though it is mandatory." she said. Asher questions the secrecy that surrounds projects; the government, even under the right to information, denies data. "I have filed two rtis on the posco issue with the Orissa government, but both have been rejected giving ludicrous reasons. The first time the information officer wrote back saying my signature was at the incorrect place. In the second instance, they said I had failed to deposit Rs 10 as the processing fee against the application." Industry twists or bypasses every law, while the government looks away. The biggest violations have been under of the rules laid down by Environmental Impact Assessment (eia) notification of 1994 and 2006. Under these guidelines, a proponent seeking to set up a projects needs to study the environmental consequences of his activity and suggest suitable remedial measures as well as alternative sites in case the ecological damage is far reaching. But the eias conducted by private consultants for project proponents usually--deliberately--misrepresent flora and fauna as well as the ecological structure of the region. Usually, these reports are copy-and-paste exercises. According R J Ranjit Daniels, director of Care Earth Foundation, a Tamil Nadu based environmental agency which prepares eia reports, the problem is proponents sideline environmental issues to a mere ritual "A good eia needs a substantial amount of study of the environment and ecology of a particular area. But because the proponents are always in a hurry, the eias get made in a few months time." Also, "the expert committees (in the Union ministry of environment and forest) meet for a few hours where they discuss a number of projects. It is impossible for them to actually study one eia, forget all of them." In a sea of projects, there are a handful where people have had their way. In January 2008, Goa backed out of sez projects it had committed to. In June and July 2008, the Sikkim government pulled the plug on seven hydropower projects. The otherwise nonchalant Puducherry took to the street in April 2007 to make its government to rethink on a port project. Uttarakhand, in a flurry of dam-making activity has had to say no to large hydropower projects in the state. But the rest? As governments and industry lose face, and credibility, all over the country, people will have their say. Democracy, and protest, seem the only bulwarks that can challenge the State's business-as-usual mentality. But must India be engulfed in violence, for development's sake?